As you can see, the top of the bookcase has our Miniature Mass kit I purchased 3 years ago. We will be focusing on the Mass this year, so it's a great teaching tool to have around. It's high enough so the baby won't be able to get to it. We already have one cruet missing due to curious little hands ;) I do need to polish the brass sometime soon and get candles for the altar. The first shelf has Catholic Mosaic on the right with most of the books that go along with it, Christmas Mosaic on the left, also with most of the books I have collected throughout the years and Meredith's lovely new book, Mondays With Mary. This one is such a beautiful addition to our Liturgical year and i can't wait to start using it with our family. The second shelf has most of the religion books we will be using for homeschooling this year. In the middle of the bookshelf I have Every Day Graces and our Alleluia letters tucked away for Lent. I hope this will help bring our Catholic faith to life by this visual display of such beautiful books. Today for the feast of St. Valentine, we will be reading Saint Valentine and the kids will color the picture of St. Valentine from Fenestrae Fidei to go into our Liturgical year notebook from Catholic Mosaic. 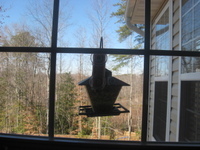 My husband and I went on a date to the craft store this morning and purchased a new birdfeeder and lots of birdseed for our feeders. 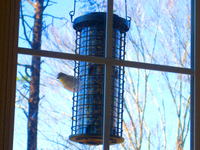 We've been getting quite a few varieties of birds this week, although I haven't been able to take pictures of them. 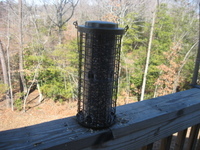 Here are the new feeders. ETA- We had a visitor this afternoon.